If a discussion of autism goes on long enough in the online parent community, the question of vaccines will almost certainly come up. (I’ll note that in real life it rarely, almost never, comes up). If the vaccine topic takes over the discussion, one is very likely to hear the call for a “vaxed/unvaxed” study: a comparison of health outcomes for kids who were vaccinated compared to kids who were not vaccinated. There are at least three such studies in the works. Two are being funded by groups antagonistic to vaccines. The self-named “National Vaccine Information Center” is funding a project at George Mason University. Said study is, I believe, run by someone from NVIC. Generation Rescue is funding a project at Jackson State University, “Researching into the causes of autism”. In previous years, Generation Rescue was funding Jackson State for a project “vaccination status and health outcomes among homeschool children in the United States”, which is likely the same project just with a different name. Perhaps that’s the same study that the founder of “Focus Autism” is complaining about here. Either way, there are two, maybe more, vaccinated/unvaccinated studies that have been underway for a few years, funded by groups generally antagonistic towards vaccines. As an aside–in online discussions, the people calling for a vaxed/unvaxed study are connected to Generation Rescue and NVIC. And yet they act like no one is doing such a study. Dr. Insel: So I might add, we have just done that study looking at, in this case, tens of thousands of children in a large health care system — younger siblings, many of whom did not vaccinated. So we could, whether you like it or not, compare what the risks are, both the risk for autism and the risks for medical consequences for not being vaccinated versus being vaccinated in children who have presumably some genetic risk because they’re young sibs. And those data are submitted for peer review. We should — maybe by July we’d be able to have that presented here. So I’ll be happy to, since we’ve funded that through, be happy to ask the authors to come and talk to us about the results. That statement was in April. 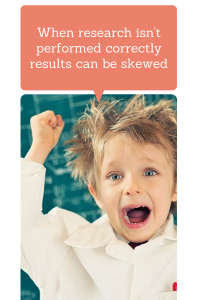 We just had the July IACC meeting but the results were not presented. The study is in the works, though. At the time Dr. Insel made that statement it struck me that this study was likely a part of a project by the Lewin Group. The Lewin Group presented at the IACC in early 2013. That project has not yet been published, but the results presented last year were very interesting, so I’ll take some time to go through those results here. Keep in mind that it’s possible the upcoming vaccinated/unvaccinated study is not by the Lewin Group. When I read or hear “comorbid conditions” discussed by advocacy groups or parents, they are almost always those conditions which those groups feel are part of their “vaccines cause autism” picture. Gastrointestinal complaints–falsely linked by Andrew Wakefield to the MMR vaccine and autism. Mitochondrial/metabolic disorders, brought to prominence by a famous vaccine court case. Yes, in this study metabolic dysfunction and gastronintestinal/nutritional conditions are about 4.5 times more common in ASD kids. About 20% of kids are in the gastronintestinal/nutritional conditions group (I wonder how that breaks down into GI and nutritional as separate groups). About 5% have metabolic conditions. But what if I were to tell you that these are not the most common comorbid conditions in ASD children (and ASD adults are yet another story)? Not by a long shot. About 70% of ASD kids have neurological disorders. About 70% have mental health conditions. 70%. 24 times higher than the general population for each condition. You just don’t hear that from groups promoting vaccine causation. Groups like SafeMinds. Which brings us back to the vaccinated/unvaccinated study SafeMinds is concerned about. SafeMinds is preparing its readers for the vaccinated/unvaccinated study. Although they’ve been calling for this study for a long time, a fact they remind us of this fact in their article: The NIH is slated to release the results of a study on autism in vaccinated, partially vaccinated, and non-vaccinated children. Here’s what you need to know BEFORE it comes out. Autism prevalence increased rapidly in the late 1980s. The epidemic increased simultaneously in states across the United States, indicating that U.S. children were exposed to toxins in a consistent manner across the entire country. 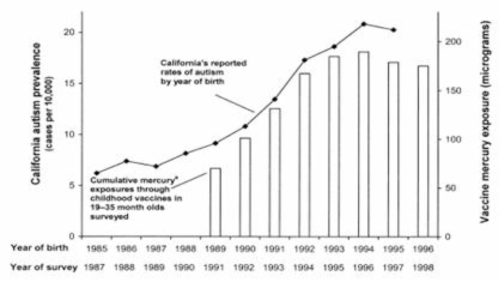 Due to the high adherence amongst the states to the CDC-recommended vaccination schedule, vaccines typically introduce a new exposure to children simultaneously throughout the country. For people who actually looked at the CDDS data, we know the idea that autism was rising in the same way in various locations wasn’t true. The whole basis for a universal exposure causing the rise in identified autism was false. It’s one of those facts that made me question the vaccine hypothesis long ago. CDDS data even in 2000 showed autism rates varied wildly across the state of California and the increase was not the same from region to region within the state. Special Ed data (which has major limitations but is likely the data SafeMinds was using to make the above statement) showed large variation from state to state in the number of people getting services under the autism label. There is not and never was data to support the assertion SafeMinds makes above that the rates of autism increased simultaneously across the US. All this is my long-winded way of saying, I find it more than ironic that SafeMinds wants to warn me about flawed research leading to bad conclusions. 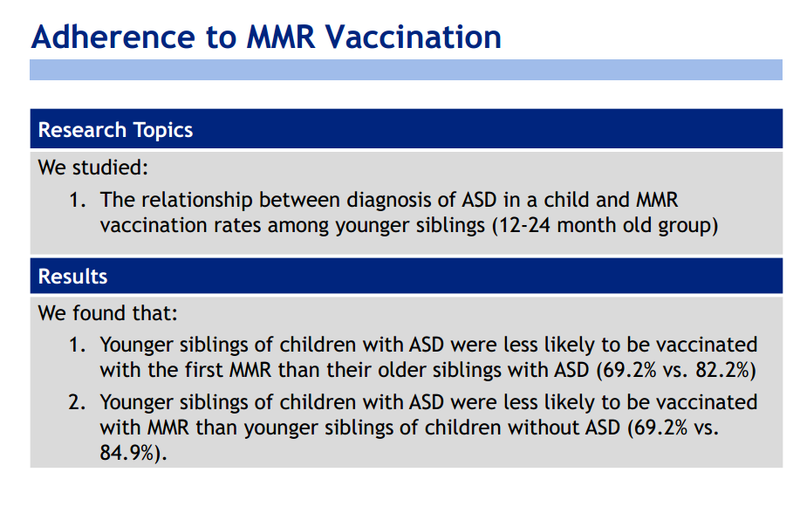 Instead, because siblings of children with autism were less likely to be vaccinated according to the recommended schedule, both correlations and multiple regressions revealed a significant relationship between higher rates of vaccination and non-ASD behavioral outcomes. Or, to put it simply, if you look at younger siblings, they get fewer vaccines than the general public and have a higher rate of autism. If correlation is causation, this would mean that vaccines prevent autism. Which, in at least one case, is true. Correlation is not causation, though. The new study will likely find that delaying or forgoing vaccines does not reduce autism risk. And that, in my view, would concern SafeMinds. Enough that they want people prepared in advance for what to them will be “bad” news. Special Ed data (which has major limitations but is likely the data SafeMinds was using to make the above statement) showed large variation from state to state in the number of people getting services under the autism label. As I’ve recently had reason to decide whether to switch a graph from IDEA (administrative) to CDC prevalence data (if anyone has 50+CDC+PR for 1995–1999 by cohort for the former, it would be very helpful), I thought I’d point out this, which has started to make the rounds, although sometimes in comically misinterpreted fashion. For anyone who hasn’t looked at it, Shattuck (1996) is worth while for the take on the limitations of the data (particularly the second paragraph of the “Comment” subsection of “Results”; I’d be fascinated to learn why the AAP pub. board eschews section numbers). Submitted by: The Lewin Group, Inc. I don’t know if the google link will work…It also says that only 5% of kids are unvaccinated, where you show higher numbers here, up to 30% regarding the MMR. Lewin Group also did some interesting work on the viability of the non-whole cell pertussis vaccine. http://cid.oxfordjournals.org/content/54/12/1730.full It appears they don’t tow the party line. I like that. I’m not saying it’s an evil coverup, but I still don’t think there is a vaccinated/non-vaccinated study. It appears to be too difficult to do. 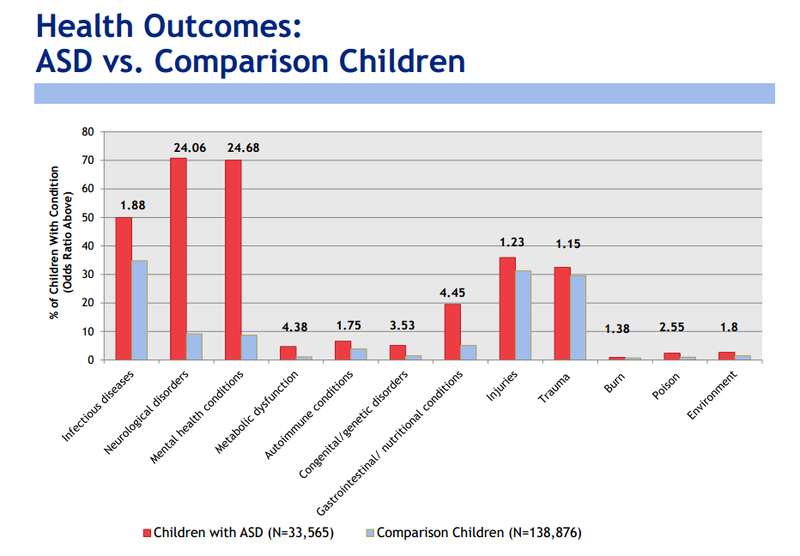 I think saying ASD siblings are less likely to be vaccinated but more likely to be ASD than control is more than a false equivalency, it is just apparent. I don’t really know what those words mean, I’m kinda talking out my…uhm…bobble headed brain. I’m not ashamed to be wrong. It means I’m trying. Studies have a way of disappearing….C.Lord did a study that showed that only 10% of autistic kids have a very positive outcome, and that regardless of intervention. What it said to me was intervention makes no difference. When I went to Pub Med to find it a while back, I couldn’t. Think of the monied people that would tick off, to say intervention makes little to no difference in outcome. Who knows how often things just go away when they are not politically expedient? Would they be comparing younger siblings to the general public? I would think they would be comparing never vaccinated younger siblings to fully vaccinated younger siblings to try to see if vaccines make any difference in kids who might have a genetic predisposition to adverse effects from vaccines. Assume it is an extension of the Lewin Group study. Check page 6 of their IACC presentation. They have ASD kids with a comparison group, ASD siblings with a comparison group and parents with a comparison group. If correlation is causation, this would mean that vaccines prevent autism. Which, in at least one case, is true. I would love to see that evidence, but you created a borked link, unfortunately. I will accept that as true, if only because I count a link to information hidden behind a login page or paywall as borked as a link that is actually broken. @ Sullivan: The second link you provided not only worked, but I was able to follow a further link from it to the full article, so thanks for that. The link was to Medscape, which has free registration. It just shows more of the article, which you get if you click on the PubMed page because there are two other links to the free full article. Sometimes we forget that not everyone has registered for Medscape, just like many of us have not signed up for Facebook or Twitter. Not a problem. My criticism was aimed mostly at organisations that require registration to read Open Access articles and those that use paywalls to hide information that would otherwise be free. I never sought to criticise any individual on this site because s### happens, as I well know. Sorry for the difficulties. I intended to link directly to the paper rather than the pubmed abstract. No need for apologies, mate. I was able to read the article, exactly as I requested, and that’s all I needed. That’s cool. I understand that issues on the end of a link aren’t necessarily your fault, but thank you for doing what you could so quickly. … or do you think he was referring to another study? Sorry if I missed an update as I was searching back through. A pingback from Anne Dachel which exemplifies the errors many people are making in regards to the IACC. Note the title of her article: “******IACC conducting vaxed/unvaxed study?”. See the mistake? The IACC is not doing a study. That is very clear in the article above. That mistake is based on a more fundamental mistake–that of understanding what the IACC is and what it can do. The IACC can not conduct a study. It’s not a research group. It has no budget nor charter to do research. The IACC can not even solicit nor is it involved in approving projects which are submitted to government agencies. The IACC is an advisory committee only. Had Ms. Dachel read the above article, she would see that the study is being performed by a group outside the IACC, possibly the Lewin Group. A lot of criticism targeted at the IACC is based on a misconception of what the IACC is and what it can do. The above is a great example of that misconception. I welcome criticism, but criticism based on misconception isn’t helping anyone. As always, my comments are my own and do not represent those of the IACC. I’ll add–I had no idea this study was ongoing before Tom Insel mentioned it in a meeting. I have no more information about it other than what was said and the speculations made above. The Lewin Group did mention vaccination status of children [edit to add: MMR vaccination status] in their presentation to the IACC and I wondered at the time if they had the data to do a study. My guess is that, like SafeMinds, many people will start looking for ways to discredit this project before it is released. They’ve asked for it, but if the answer isn’t what they want, they will attack it. Again, my own views only. They’ve asked for it, but if the answer isn’t what they want, they will attack it. Which is one of the reasons I never get a straight answer to the basic question what the demanded signal threshold is. Let’s quote the Dachelbot: “But they’ve never done the one simple study that could settle the issue overnight.” Etc., etc. Well, this study may be primarily younger siblings. So we will hear “that’s not what we wanted”. After Tom Insel told everyone that this study was in the works, Jan Crandy thanked him and then Lyn Redwood spoke for some time, never acknowledging this new study. …And the last thing I want to say, Dr. Insel, is I’d like for you to answer the last person’s question about adding vaccines to the agenda, the meeting that we had previously with Dr. Gellin. What is the status of that, because it is still an urgent issue that needs to be addressed and needs to be researched? Ms. Redwood: But that’s an epidemiological study, correct? I think what the families are looking for are studies that go beyond epidemiology, that look at the children that regress with mitochondrial abnormalities after vaccinations, like Hannah Poling, and other studies that look at things beyond just an epidemiological study in a high-risk population. Dr. Insel: Well, this would have been a high-risk population. I don’t know that there would be mitochondrial data from any of the subjects because, you’re right, it was essentially through a health care system, so it’s a records kind of study. But it does give you a sense within a group that you would think would be high risk, whether choosing not to vaccinate as protective, choosing to vaccinate increases the risk. So I don’t think it’ll be a single definitive study, but it does provide insights that we wouldn’t have had without it. So I think we should wait and see what that looks like. The study you’re asking for, the idea of looking at individual cases, was something that was taken on — if you remember, I think it was — with our strong encouragement by Sue Swedo many years ago, something that the Committee almost requested for her to do. And she set up a national program to go around. I think you were even part of the group at one point that was designing this to interview individual families for whom they had a very clear story of regression. And if you like, we could have her come to the meeting and report out on that. I don’t think the data are published, but I’m sure she would be willing to say what came out of that. They set it up and asked their members to participate. They’ve got 20 responses total, 6 are in favor of the bill passing. Now, one might say that 70% against is a big lead, but it’s only them advertising this effort. And 20 people isn’t that big a response. They are putting out a call every few days to the same people to call a small group of senators. By having them call over and over, it gives the appearance of a larger group than they really have. It is a small group that they are targeting. Small enough that I was able to visit the offices and talk to staff fairly easily. Here’s a screenshot of a page from the appendix. One of the possible studies recommended was an epidemiological study comparing vaccinated and unvaccinated children. It was recommended by Scott Bono and Lyn Redwood. I find that a bit strange compared to the reaction to the announcement of an upcoming vaccinated/unvaccinated study.